The glittering tapestry of young stars flaring to life in this new NASA/ESA Hubble Space Telescope image aptly resembles an exploding shell in a fireworks display. This vibrant image of the star cluster Westerlund 2 has been released to celebrate Hubble's 25th year in orbit and a quarter of a century of new discoveries, stunning images and outstanding science. On 24 April 1990 the NASA/ESA Hubble Space Telescope was sent into orbit aboard the space shuttle Discovery as the first space telescope of its kind. It offered a new view of the Universe and has, for 25 years, reached and surpassed all expectations, beaming back data and images that have changed scientists' understanding of the Universe and the public's perception of it. In this image, the sparkling centrepiece of Hubble's silver anniversary fireworks is a giant cluster of about 3000 stars called Westerlund 2. 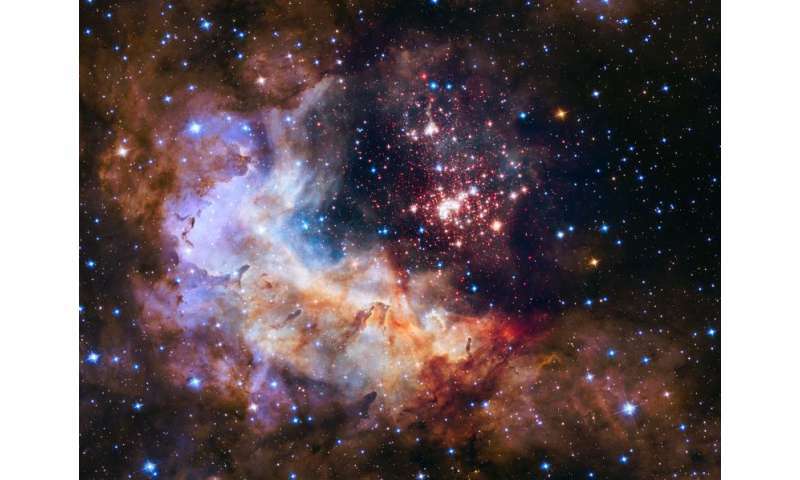 The cluster resides in a raucous stellar breeding ground known as Gum 29, located 20 000 light-years away in the constellation Carina. The stellar nursery is difficult to observe because it is surrounded by dust, but Hubble's Wide Field Camera 3 peered through the dusty veil in near-infrared light, giving astronomers a clear view of the cluster. Hubble's sharp vision resolves the dense concentration of stars in the central cluster, which measures only about 10 light-years across. Besides sculpting the gaseous terrain, the brilliant stars can also help create a succeeding generation of offspring. When the stellar winds hit dense walls of gas, they create shocks, which generate a new wave of star birth along the wall of the cavity. The red dots scattered throughout the landscape are a rich population of forming stars that are still wrapped in their gas and dust cocoons. These stellar foetuses have not yet ignited the hydrogen in their cores to light-up as stars. However, Hubble's near-infrared vision allows astronomers to identify these fledglings. The brilliant blue stars seen throughout the image are mostly in the foreground. The image's central region, containing the star cluster, blends visible-light data taken by the Advanced Camera for Surveys and near-infrared exposures taken by the Wide Field Camera 3. The surrounding region is composed of visible-light observations taken by the Advanced Camera for Surveys. This image is a testament to Hubble's observational power and demonstrates that, even with 25 years of operations under its belt, Hubble's story is by no means over. Hubble has set the stage for its companion the James Webb Space Telescope—scheduled for launch in 2018—but will not be immediately replaced by this new feat of engineering, instead working alongside it. Now, 25 years after launch, is the time to celebrate Hubble's future potential as well as its remarkable history. How do astrophysicists determine that the cited language below is true, and that the explanation is not that red/blue light from the celestial objects in question are emitting said colors because of their trajectories (i.e., red moving away, blue moving toward Earth)? "The red dots scattered throughout the landscape are a rich population of forming stars that are still wrapped in their gas and dust cocoons. These stellar foetuses have not yet ignited the hydrogen in their cores to light-up as stars. However, Hubble's near-infrared vision allows astronomers to identify these fledglings. The brilliant blue stars seen throughout the image are mostly in the foreground." To measure red-shift (or blue-shift) due to movement away (or towards) us, we need to know the original frequency, so we use spectral lines, not the overall colour of the star. A blue star could have red-shifted spectral lines, and still appear blue. Here's a simple site to give you a hint what spectra are for. Note that the lines are red/blue shifted by relative motion to us (and redshifted by expansion). What is not shifted are the positions of the lines _relative_ to one another. So by the characteristic groupings you can still tell what kinds of elements/molecules are present even after a red/blue shift. There's a lot more info you can get by looking at the fine detail of spectra. They're a real treasure trove of data. Sorry, svenjamincw, I wasn't sure how much you knew (or didn't know). As antialias says, the characteristic groupings of spectral lines tells us what element is producing them, and so we know what frequencies they would have been emitted at, because we can produce those lines in the lab.The red-shift (or blue-shift) can then be measured by comparing the 'at rest' frequencies with the 'light from star' frequencies. The shift is a Doppler shift, like the sound of a siren changing pitch if it's travelling towards or away from you. The colour of the star as a whole will also be shifted, but a blue star may still appear blue even so, if its peak emission is well into the blue part of the spectrum.